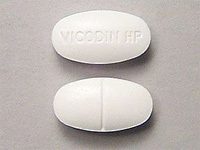 Vicodin is an opioid derived from either of the naturally occurring opiates codeine or thebaine. Vicodin is an orally active narcotic analgesic and antitussive. The typical therapeutic dose of 5 to 10 mg is pharmacologically equivalent to 30 to 60 mg of oral codeine. Sales and production of this drug have increased significantly in recent years, as have diversion and illicit use. As a narcotic, Vicodin relieves pain by binding to opioid receptors in the brain and spinal cord. It may be taken with or without food. When taken with alcohol, it can intensify drowsiness. It may interact with monoamine oxidase inhibitors, as well as other drugs that cause drowsiness. It is in FDA pregnancy category C: its effect on an unborn embryo or fetus is not clearly known and pregnant women should consult their physicians before taking it. Vicodin can be habit-forming, and can lead to physical and psychological addiction. Vicodin addiction affects the mental, emotional, physical and spiritual aspects of a person's life. In addition, Vicodin addiction can tear apart families, ruin relationships and leave lives in shambles. Many people who are addicted to Vicodin want to stop but find that they are unable to live without the drug. By understanding the devious nature of Vicodin addiction, helping yourself or someone you love is a much easier task. Vicodin addiction is a growing crisis in the United States. While illegal drugs like cocaine, marijuana, methamphetamine, and heroin remain in the headlines many individuals may be surprised to know that Vicodin addiction could lurk right behind them as one of the most widely-abused drugs of addiction. In fact, the federal Drug Enforcement Administration believes Vicodin may be the most abused prescription drug in the country. Nationwide, its use has quadrupled in the last ten years, while emergency room visits attributed to Vicodin abuse soared 500 percent. The most frequently observed adverse reactions include lightheadedness, dizziness, sedation, nausea, and vomiting. Some less common side effects of Vicodin are allergic reaction, blood disorders, changes in mood, mental fogginess, anxiety, lethargy, difficulty urinating, spasm of the ureter, irregular or depressed respiration and rash.